Satellite images document the extent of illegal logging inside the Monarch Butterfly Biosphere Reserve in Mexico. The left image was taken on 14 March 2004 and the right on 23 February 2008. Geographic Information System (GIS) analysis indicates that 450 hectares (1,112 acres) were severely degraded over the four years, mostly within the local community known as Ejido Crescencio Morales, in the state of Michoacan. This butterfly area, known as Lomas de Aparacio, is on one of the 12 known mountain massifs that provide overwintering habitat for the monarch butterfly. If they return here in the future, monarchs will be unable to survive freezing during the winter with such severe forest degradation. Unfortunately the Mexican government has failed to enforce the law against logging in this area of the Reserve for at least four years. 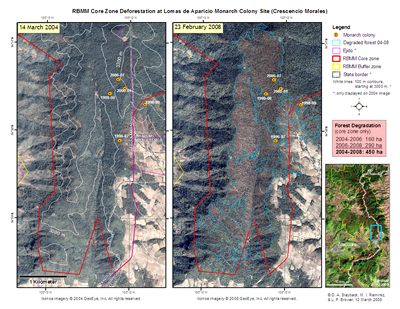 Note: another image taken on 9 March 2006 indicated that, of the 450 degraded ha, 160 ha were cut between 2004 and 2006, and that the logging accelerated between 2006 and 2008, when an additional 290 ha were degraded. You can see the 2006 satellite image on Google Maps, the image that was taken before the 290 additional hectares were cut. How to contribute to further research: You can support Dr. Brower's further satellite monitoring, GIS and microclimate research in collaboration with colleagues and students at UNAM-Mexico. Checks should be made out to "Monarch Fund, Sweet Briar College" and mailed to: Dr. Lincoln Brower, Sweet Briar College, Sweet Briar, Va 24595. Ikonos imagery, copyright GeoEye, Inc. The current images were created by Lincoln Brower (Sweet Briar College), Dan Slayback (SSAI, Inc) and Isabel Ramirez (Universidad de Mexico, Morelia), and funded by the Monarch Butterfly Sanctuary Foundation. The red line is the Core Zone: The red line delineates the Core Zone of the Reserve that was supposedly protected against logging by Presidential Decree, issued by President Ernesto Zedillo in November 2002. The yellow dots show butterfly colonies: Positions in the forest that have hosted colonies of overwintering monarch butterflies since they were discovered in 1995 are indicated as yellow dots.